LONDON — Race Imboden is worried about his mother. Specifically, he's wondering how she'll behave as her son battles his way through the London Olympics in a quest for the first gold medal for a U.S. men's fencer in the individual foil. Fiona is his "crazy, emotional mom from England," already crying over Skype about her 19-year-old son's chance to make history in her birth nation. "She's emotional about me competing. She's always pacing back and forth in big rooms while I'm fencing," he said. "But she has an assigned seat here, so we'll see how that works." 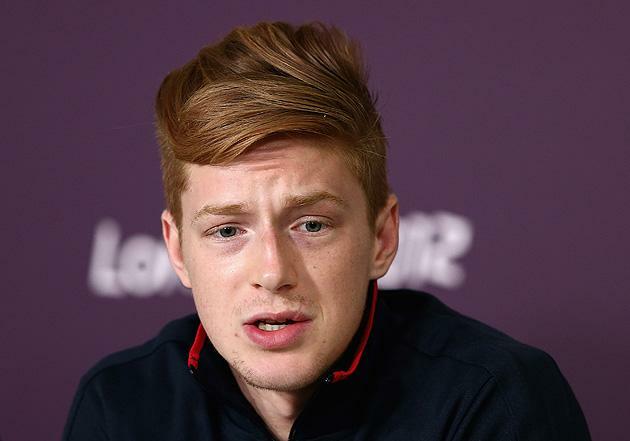 The London Games mark the first time Imboden's parents — his father is a producer for CNBC — will watch him compete overseas. Their trip to London has a bittersweet context: Fiona's mother, Eileen Scotland, passed away earlier this year. His parents said goodbye to her upon arrival, spreading her ashes ceremonially. Imboden can still recall trips to London area armories with his grandmother, looking at medieval swords and other weapons. He remembers coming across fencing equipment, giddily exclaiming "Hey, that's what I do!" He said he doesn't plan on any tributes to her during the Games. "I can't do anything but stick to what I do, and do the best I can," he said. "My goal is to take fencing to the next level." As Imboden speaks confidently about this objective, and one begins to believe there's a sensation here ready to break big in the U.S. He's a charismatic spokesman for his sport, and a Brooklyn hipster with a memorable look: a shock of red hair on top, with shaved sides. It's a little Morrissey, a little Conan O'Brien; Imboden refers to it as the "classical mad man haircut." He used to ride BMX before getting into fencing. "That was one of my first sports. And it was way before it was an Olympic sport," he said. Would he try the Olympic BMX course while he's in London? "Oh man, no. I'm not getting on there," he said. "I want to be able to at least walk before I get to my venue." 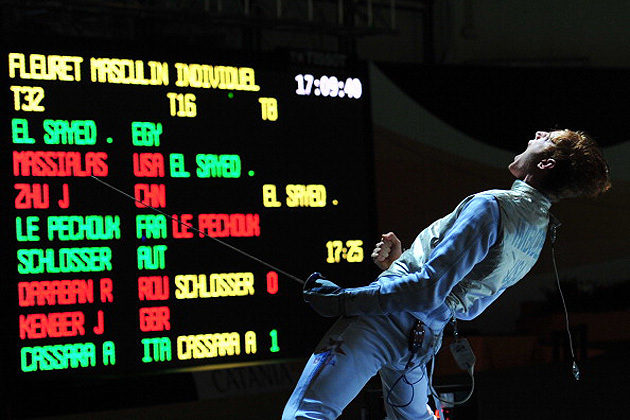 Imboden's journey in fencing began 11 years ago, when he was a samurai. Or maybe it was a Jedi? Imboden — his first name, Race, was inspired by the character of Race Bannon from the old "Johnny Quest" cartoon — was play-fighting with some friends in an Atlanta park when he was 8 years old. He was a "Star Wars" fan, but more than anything was inspired by samurai swordplay, from films to books. A stranger walked up to his parents, noting his enthusiasm, and suggested they encourage him to try out fencing. He had to wait about a year before he was old enough to enter the sport, but immediately took to it. Training and travel costs were significant, so his family made a sacrifice: Imboden would travel alone to tournaments around the world, his parents remaining home. "I had to make the decision while I was young. If I was going to take this to the point where I wanted to take it, it meant I had to travel and do all the preparation on my own," he said, adding that his first solo trip was at 14 years old. While other young star athletes might have taken advantage of the lack of parental guidance, Imboden said his coach and the structure of the tournaments kept him on the straight and narrow. "I was so focused on the events, it was easy. Everything's laid out for you," he said. "If anything, I lost my head: 'This is crazy, I'm on my own in Paris.'" He began to develop a quirky style of fencing. He's a lefty, for starters. But he also spends a lot of time in the air on his lunges, which are usually quick for other fencers — think pitcher Tim Lincecum's leg-kick for a point of comparison. The bronze medals started to become gold ones, and Imboden quickly moved up the world rankings to No. 5 in the senior division for 2012. He doesn't just want to take it to "the next level," he wants to create a moment in which fencers could earn a living in the U.S. by competing professionally. Sometimes, that means upsetting some people along the way. Imboden signed a letter of intent with Notre Dame as a 17-year-old, but his meteoric rise in the sport made him reconsider. Notre Dame, to its credit, allowed him to get out of the agreement, and Imboden intends to enroll in a New York City school to remain near "the Mecca" of fencing that is the Big Apple. "[So I can] train to the best of my ability, which I can't do at Notre Dame right now," he said. That training is physical and mental. Imboden used to have trouble hiding his emotions during and after matches. His coach, Jed Dupree, helped him develop a samurai-like focus. "I've worked a lot in quieting my mind. Fencing's a lot about being mentally prepared," said Imboden. "Sometimes you have too much stuff buzzing around in there, and it's not good for you. So I worked a lot on focusing on things. What my footwork is. What the ground feels like when I'm moving around. Things that trigger larger things in my head." Imboden's aspirations are nothing short of making history: No American men's fencer has won a gold medal in the Summer Olympics. Only five have won silver medals since 1896. The competition begins at the ExCeL arena this Saturday, with Imboden scheduled for Tuesday, July 31. The pressure will be intense; and if you need a measure for that, just look for Imboden's mother pacing the building during his matches. "I'm expecting to see an empty seat out there," he said with a grin.